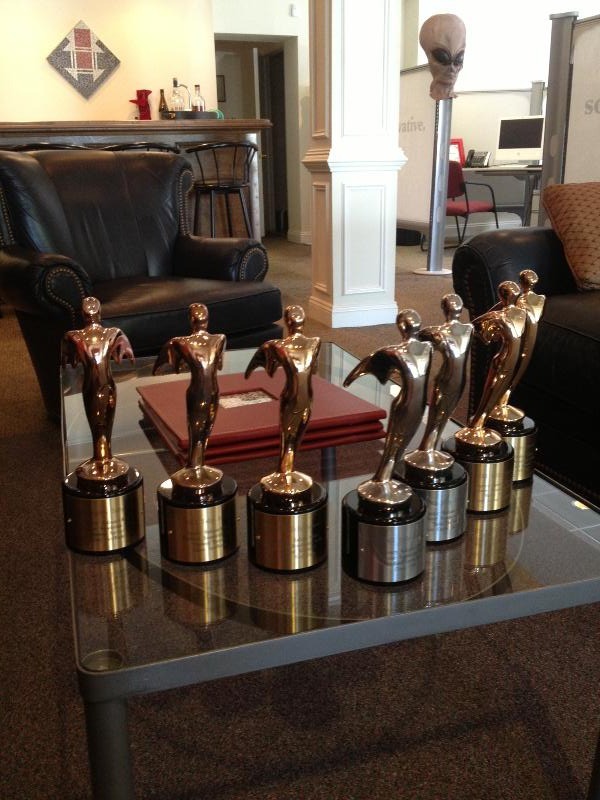 We should have everything moved in by July 17th when we host the July Media Mixer at our new digs: 101 East Cary Street. To attend our Open House/Stock the Bar Party >> RSVP on Facebook. I was delighted to get an email from my good friend Jonah Holland, Marketing Director at Lewis Ginter, who dialed me in on some cool new info on their summer-long Butterflies Live event. To celebrate America on July 4th, Butterflies Live will run all day… and it’s FREE! Monday (6/24) – On Monday we shot a cool new video for M L Bell Construction, on the site of one of their latest projects, Sette Pizza in Shockoe Bottom. You can read about the Sette project (soon Sette will be changing their name to 23rd & Main Kitchen and Taproom) here on Richmond.com. We will debut the video in a couple weeks. Special thanks to super stars ML Bell’s Mike Bell and the lovely, talented Meghan Mayfield, the hostess with the mostest. Also special thanks to Tom Earle at Cloud Solutions Group and the team at NTS who got our internet and phone service working Monday after the “big move,” since Windstream/Paetec let us down… again. Normally I try to keep the M+M Report positive, but seriously folks if you ever need a phone or Internet system, please DO NOT use Windstream. They are the worst company ever. If you don’t believe me, check out the 1,461 complaints on the Better Business Bureau website…. Yeck. Tuesday (6/25) – On Tuesday VP of Brand Strategy Kara Forbis, Account Executive Sammy Yatco and your truly drove to Winchester to meet with our clients at First Bank. It was a productive meeting and CEO Scott Harvard treated our team to Bonnie Blue Southern Market & Deli, reportedly the BEST barbeque in the northern Shenandoah Valley. 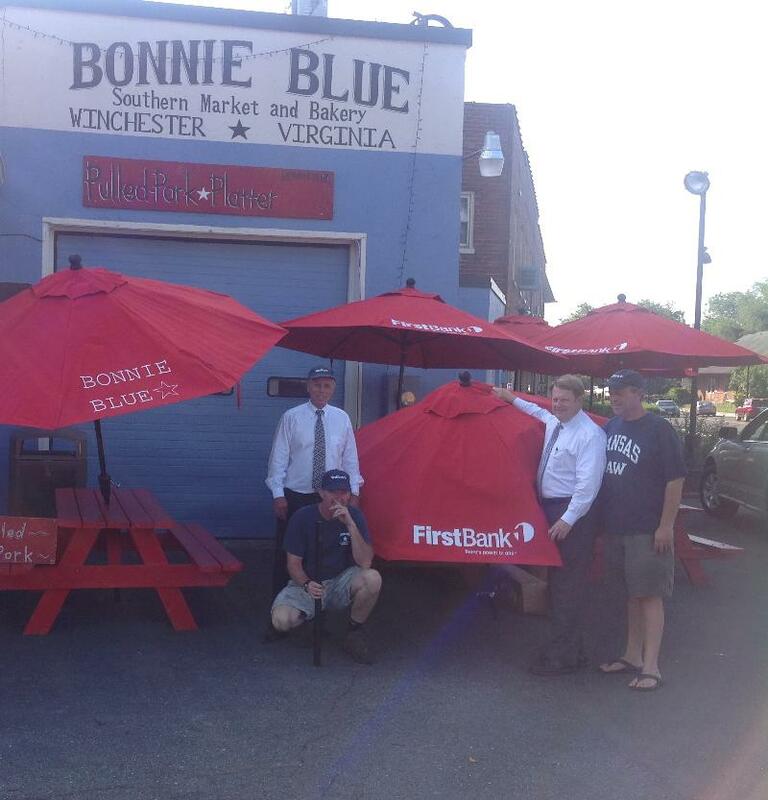 First Bank’s Scott Harvard and the guys from Bonnie Blue pose with their new red First Bank umbrellas. Wednesday (6/26) – On Wednesday we put the finishing touches on a new TV spot for Richard Bland College that will start running on broadcast and cable next week. Special thanks to Dr. Debbie Sydow and her team at Richard Bland College, who are a pleasure to work with. While I’m already in the “thank you” mode, let me send a special thank you to Village Bank President and CEO Tom Winfree for taking me out to lunch at Crab Louie’s on humpday. I continue to be impressed with the Midlothian-based bank, the “village people” and their leadership team. Thursday (6/27) – On Thursday I spent time with the Account team finalizing a brand and marketing strategy report for our good friends at Foundation Basketball. I can think of no higher endorsement other than I send my son, Jack, to Foundation. We are big fans of Coach David Anderson and his team. Foundation offers a great summer camp at a ridiculously low rate, only $149 per week! Call (804) 614-5070 or check out their website and get your kids out of the house this summer. Look what arrived on Thursday! Friday (6/28) – I’m writing this weeks edition of the M+M Weekly Report from the office. I was supposed to be writing this at Great Wolf Lodge, where we were supposed to be vacationing this weekend… but with my daughter feeling sick and me way behind on work, we decided to camp out in our new building instead. Waterslides are overrated anyway, don’t you think? I wrote about a hundred emails today and sent dozens of apologies to people I had ignored in the last couple of week’s; moving is one of the most stressful and time consuming things. I’m just glad it’s over. Now back to productivity.